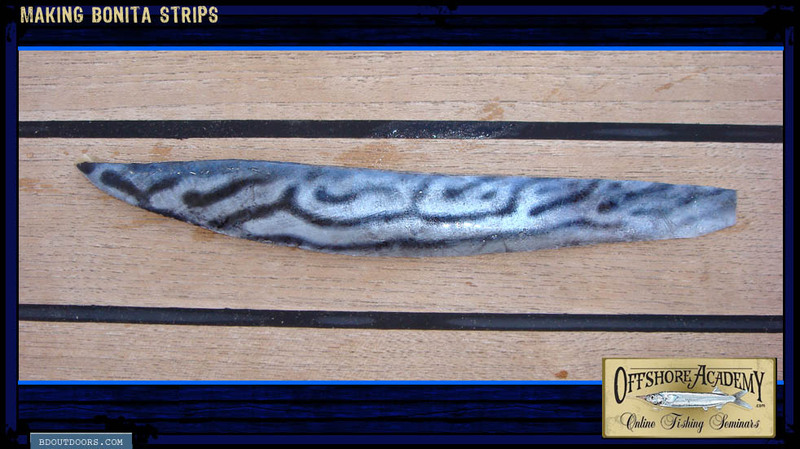 The belly meat from a little tunny, nick named bonita, works great for making strip baits. You can troll the strips, or fish them off of the bottom. They’re super easy to make and extremely effective. Just follow the directions outlined over the course of this photo essay. First, make a cut behind the gills until you get to the spine. Then fillet towards the tail, cutting just above the backbone. 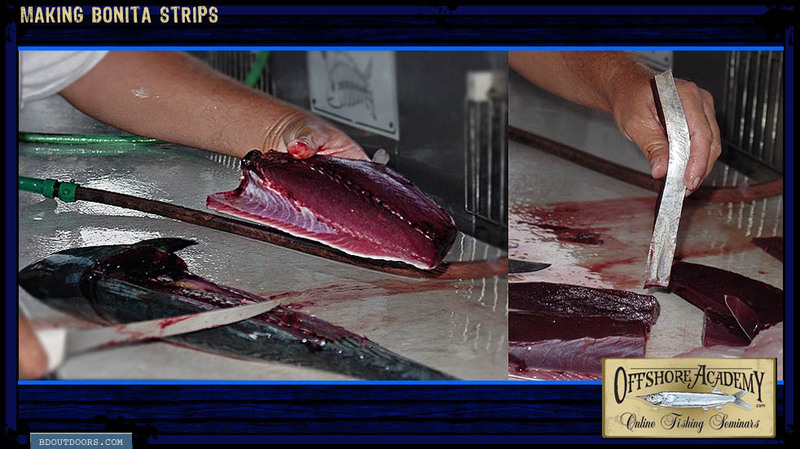 After that remove the fillet off of each side of the fish at its full thickness. 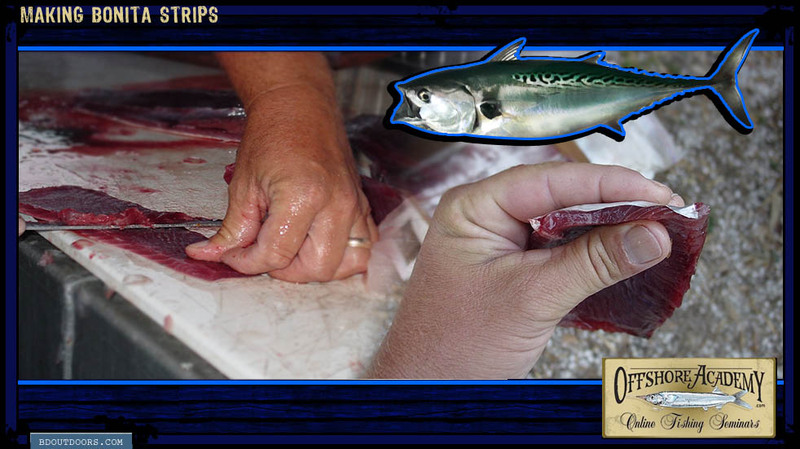 Cut out the row of bones down the center line of the fillet, leaving the top and bottom boneless portions of the fillet. I prefer the lower belly portion of the fillet for trolling strips. The skin is shiny and the grain of the meat is tighter and lasts longer. The upper portion or back can be used for trolling, but the grain of the meat is bigger. I save the top half for bottom-fishing bait. Using a sharp knife, start to trim down the meat. Don’t try to cut down the full thickness on the first cut. You want to end up with a thickness of a quarter-inch, but if you remove too much meat, it makes it harder to keep the blade level. If you cut the meat too thin or knick the skin, you will ruin that portion of the strip. Shave away small portions of meat until you reach the desired thickness, about a quarter-inch thick portion of meat on the skin. This is the final thickness. Now salt the meat side of the fillet lightly, but evenly. Use salt that is not iodized if possible, such as Kosher salt. 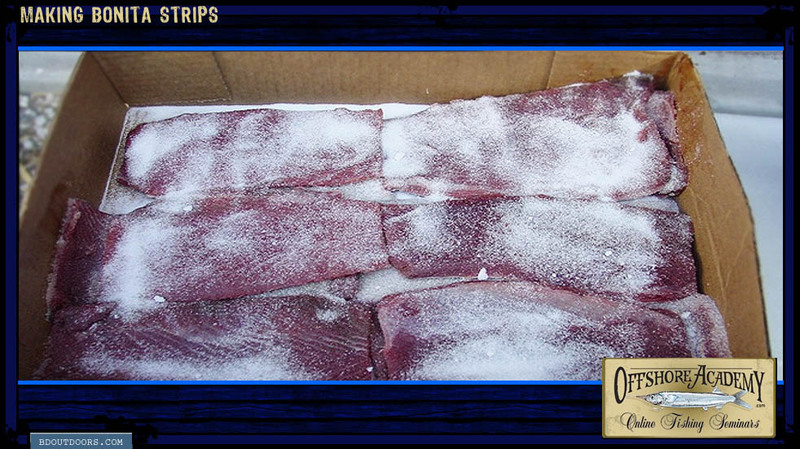 Once the trimmed sections are salted, they’re ready for freezing. To freeze the strips, put the meat sides together. Don’t bag them all in one bag. Break the baits up into portions. 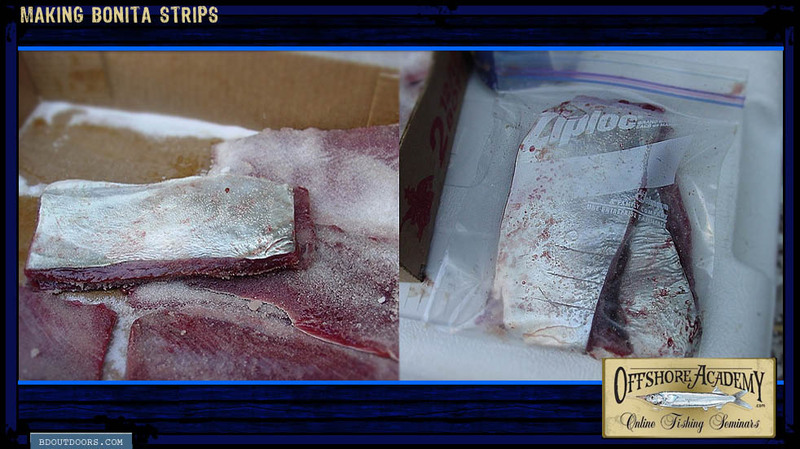 Try to keep the salt from getting in the bag’s zipper as it will not seal properly. Squeeze the air out and freeze. This is the perfect shape and diameter for your strips, so you will probably need to do some trimming. Cutting the strips requires a sharp knife. The grain of the meat (especially on the upper portion of the fish) is as tough as shingles on a roof. 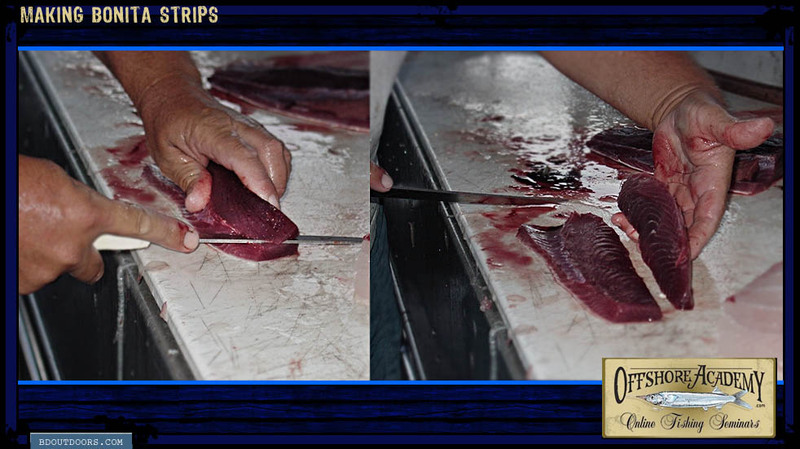 Make the front of the strip out of the tail end of the fillet. This is the desired shape with a slightly squared end used as the front of the strip. Don’t get too square. If you run it with a Sea Witch or lure, it will help keep the front of the bait streamlined. 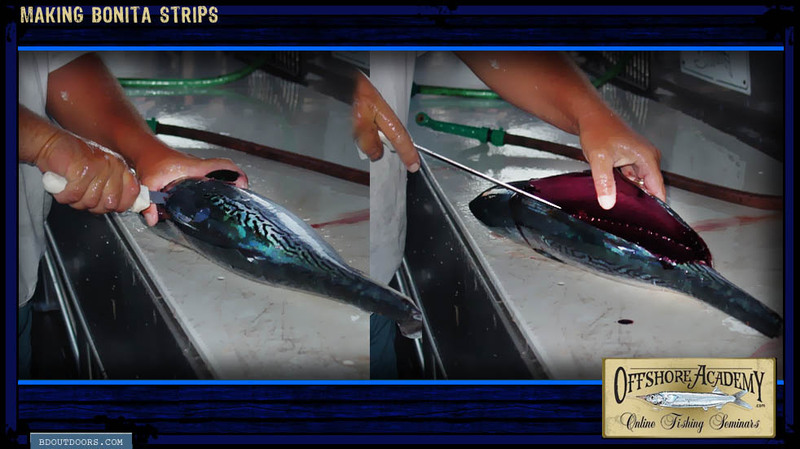 Strip baits work great offshore for a number of species. From sailfish and marlin to big yellowfin and dorado, just about any pelagic will pounce on a properly made strip bait. 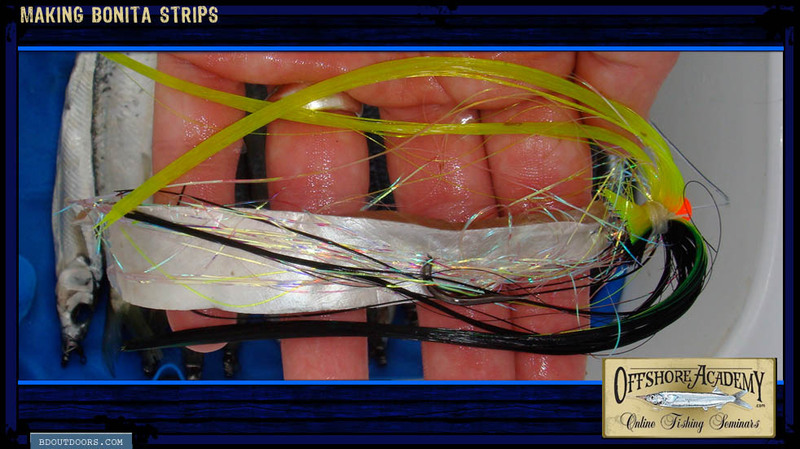 Here are a few ways we rig them: Double Hook on Mono, Double Hook on Wire, Single Hook Mono Strips. Capt. Scott Goodwin started fishing in the lakes of Kentucky where he grew up. A move to Florida, however, brought him into a whole new realm of fishing. After receiving a bachelor's degree in biology from Eckerd College, he decided that he liked catching fish more than studying them and thus began his career as a captain. 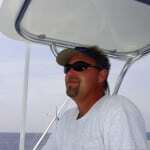 Scott began working as a mate on a charter boat and worked his way up to captain. 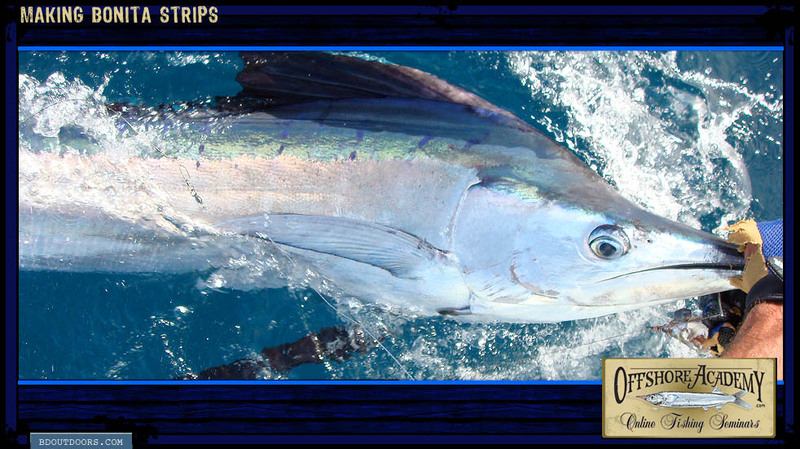 He has been fortunate to fish in some of the top locations on the globe, including Florida, Panama, Costa Rica, Mexico and the Bahamas. 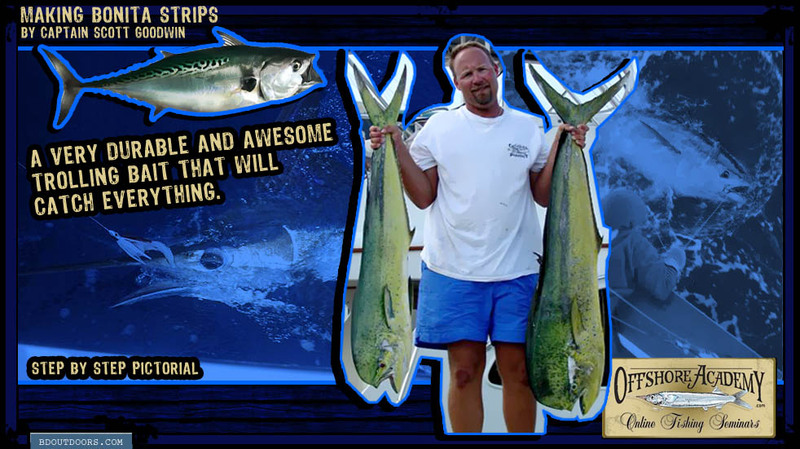 Scott has learned from some of the best captains in the sport and has more than 27 years experience as a professional fisherman. He openly shares his knowledge and fishing tips on BD. Scott is now the editor of BDOutdoors. Did You Join the SoCal Wahoo Club?